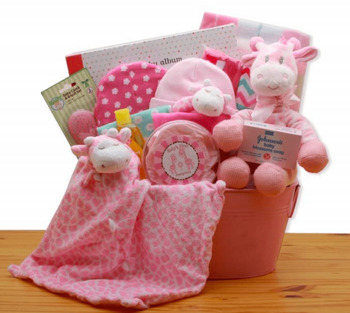 Celebrate the new bundle of joy�s arrival with this giraffe-themed essentials and keepsakes gift assortment! The pink storage tub is loaded with lots of goodies and necessities. Gift comes comes wrapped in cellophane and topped with a handmade bow. Pink Storage Tub. Gift dimensions are 13" long by 10" wide by 14" high. I've been ordering baskets from Simply Unique for a couple of years now for co-workers. I have had nothing but rave reviews from them. I plan to continue ordering in the future.